Lamb is the traditional meat served in an Italian family for Easter. Mom carried on those traditions as well as grandma did every year. We continue to use her delicious marinade recipe every Easter and it's the best lamb I to date have ever eaten. Agnello or abbacchio (as it is known in Rome where my grandma and grandpa came from) and is traditionally cooked all over the country on Easter. It is a dish made with meaning, as it symbolically recalls the religious symbol of Christ. In Italy, it is almost mandatory on Easter to have Agnello or lamb as the main course for the Easter meal, and depending on the region, it can be served in various ways. Southern Italy, the lamb is usually roasted simply with rosemary, red wine, and garlic. Down in Puglia, roasted lamb is prepared for Easter and some Regions like in Campania they have been known to serve goat instead. Mom was from Bari, Dad from Rome and between those two Regions, this was how we served our lamb every Easter and the whole family loves it. 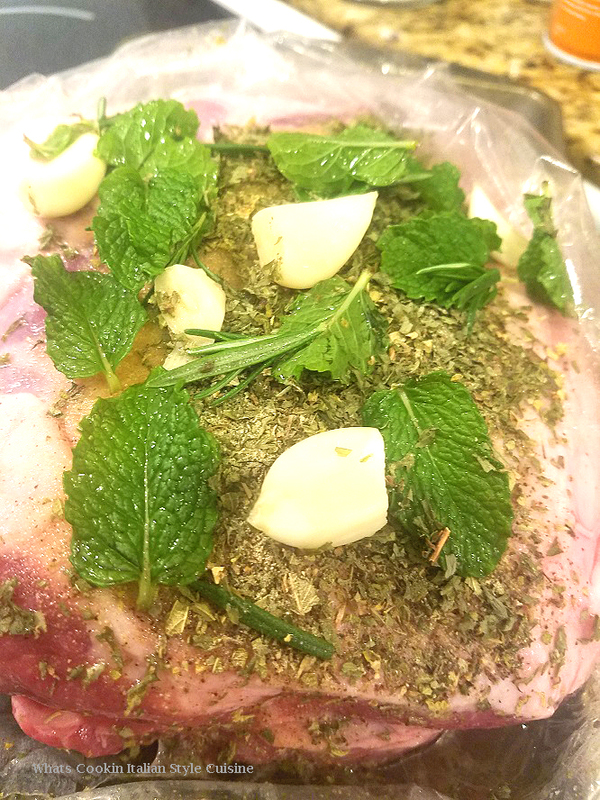 We will continue to always carry on this tradition and so will my kids, they just love this preparation of lamb. We had Leg of Lamb every Easter, it is an Italian tradition back in the 1960s with our family and still is. 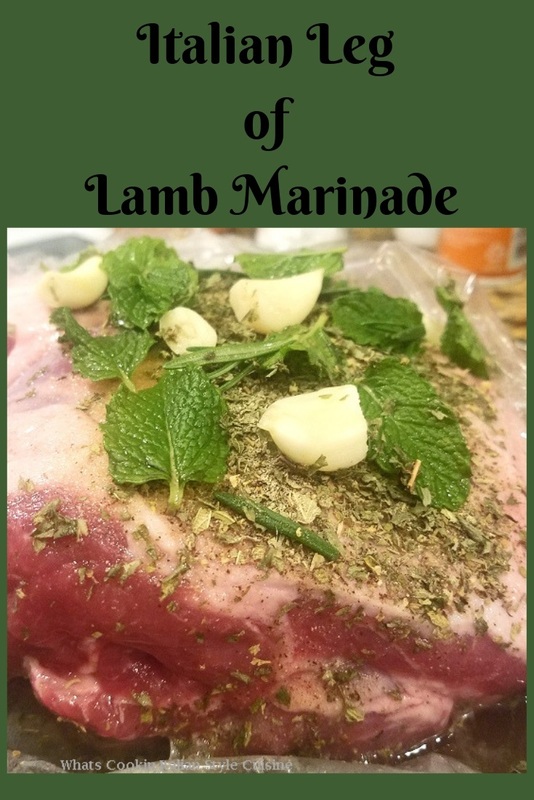 Even though mom has passed, the family loved her lamb marinade and I have never found another recipe better than this one. It wouldn't be Easter without serving this delicious roast. I always have fresh mint growing in a pot on my patio area. I love to make special drinks, tea, jelly, and mint is especially great on lamb and in salads. We were lucky enough to grow up with dad having a huge herb and vegetable garden and was pretty spoiled with everything freshly picked to cook with and eat. 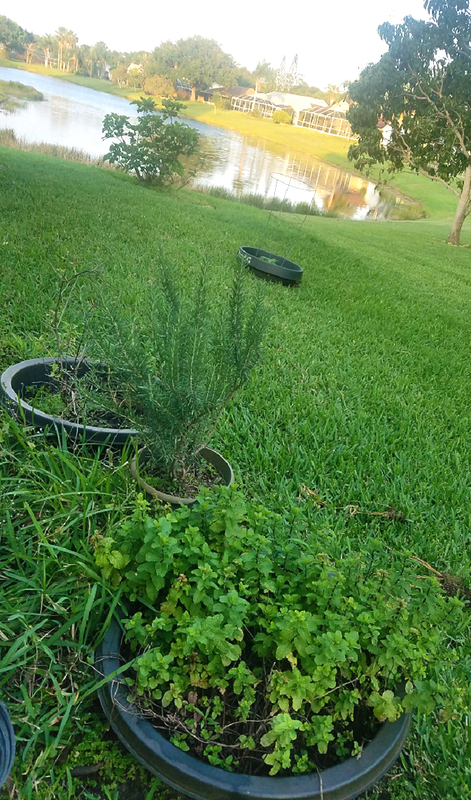 Now I have pots in my yard and love freshly picked herbs for roasting, grilling and marinating meats. Mom taught me early on how different the taste is and so much better. I usually go to a meat market and order Lamb for Easter. It's always the freshest and cut lean and perfect. I prefer getting lamb with the bone still in it and not a boneless version for leg of lamb. It really has a much better flavor with bone-in. 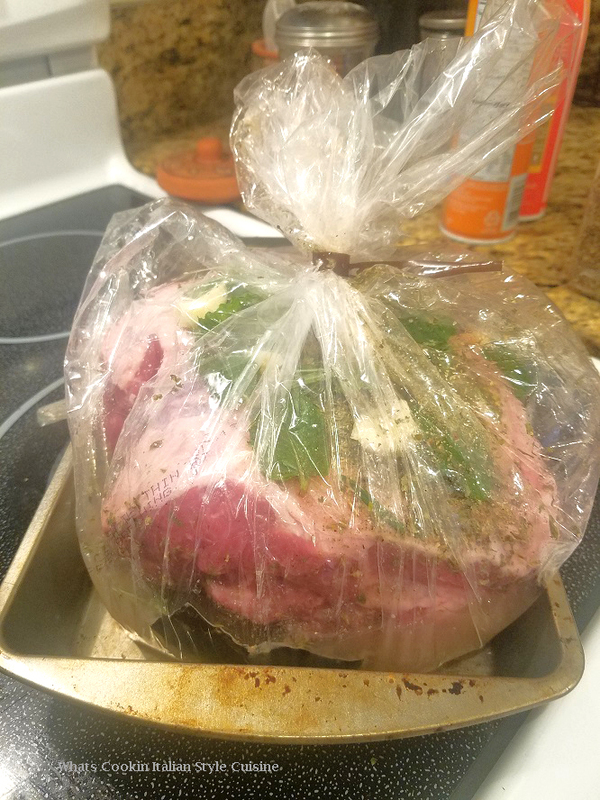 I found through the years that oven roasting bag was large enough or the Turkey size oven bag depending on how large the leg is to marinade in. It made this process much easier to use. When you are ready to cook this just cut the bottom of the bag let the juices run into the pan and slow roast the leg for around 4 to 5 hours. It's pretty simple to make and a lovely fragrant smell while it's roasting of herbs, garlic and spices. 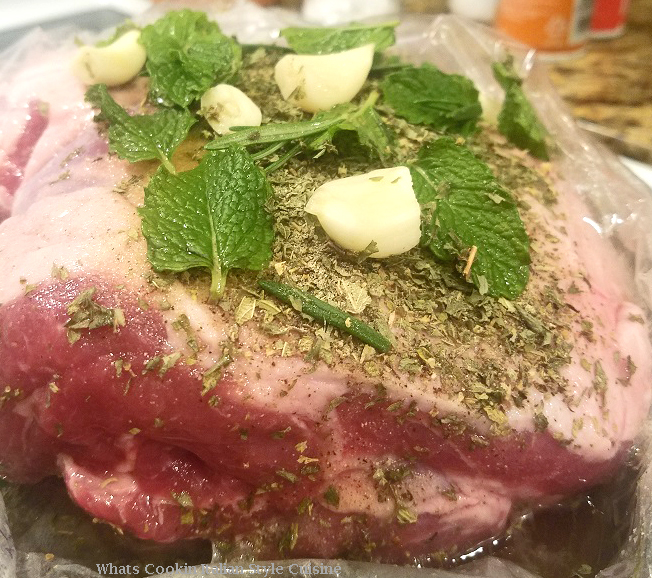 leg of lamb 4 to 5 lbs. If you prefer to use all lemon juice and no wine, it's not a problem. Substitute freshly squeezed lemon juice but add 1/4 cup of water to it. Straight lemon juice tends to cook the meats and still makes it very tender. The wine acts as a tenderizer as well, that's what mom always used. If you don't like some of the herbs used, just omit them and add more of whatever you like. You really can't overpower the flavors except for the rosemary, I would only use a very small amount of rosemary due to the pungent flavor. Everyone in our home likes the lamb medium well except one person! I check the lamb at 2 1/2 hours and if it's medium rare like my husband likes it, I slice some off and set it aside until dinner in some juice. Use the meat thermometer to get it just right for how your family likes their meat cooked. Mom always served lamb with mint jelly on the side, rice almondine, and Italian baked potatoes. We also love to serve the lamb with a side of roasted garlic mashed potatoes and corn. You can actually make one of my families favorite second meals with leftover lamb called shepherds pie. Leftover lamb also makes awesome gyro sandwiches, if you have anything left that is! If you love lamb this is going to be your new favorite recipe to try! 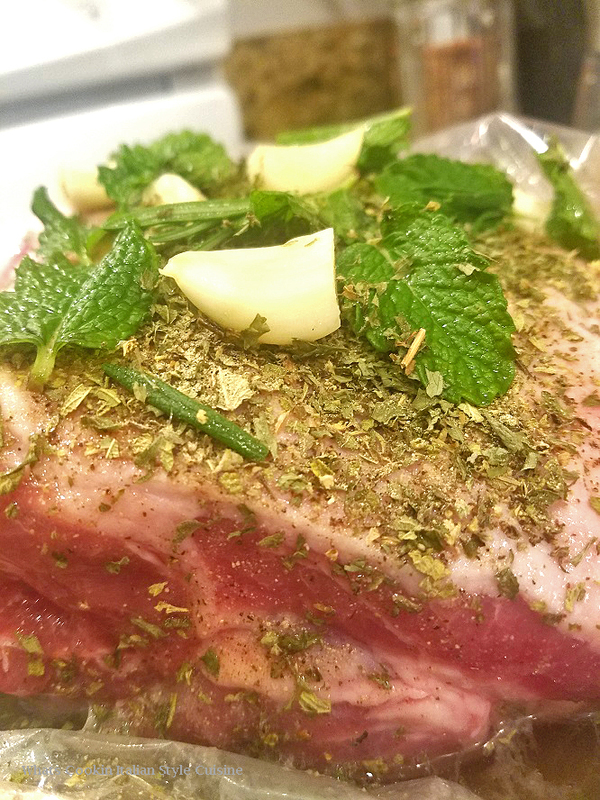 This melt in your mouth tender, the juicy roast is the best tasting marinade for making lamb perfect in flavors and taste. Do give this recipe a try and let me know what you think in the comments! This is my go-to recipe for a marinade for most gamey tasting meats. This marinade is made with fresh herbs, spices, and a good grade white wine overnight. The meat is delicious and fork tender. 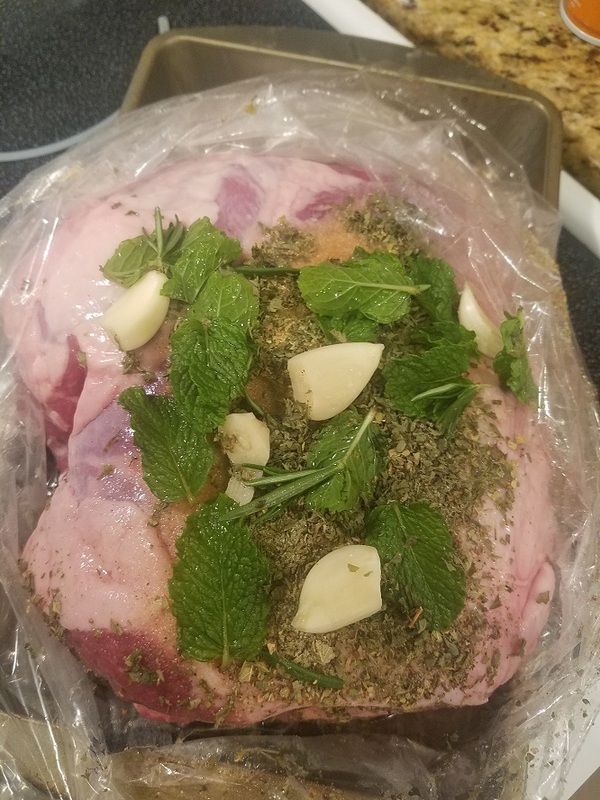 1 leg of lamb 4 to 5 lbs. Remove the lamb from the wrapping, it isn't necessary to rinse according to the USDA but I do drain off the excess blood. Place in a large oven roasting bag or large pan that will be covered to fit the leg. Make slits in the lamb on the bottom and top and place whole cloves of garlic randomly throughout the meat. Sprinkle evenly with granulated garlic, oregano. Top with all fresh herbs. Pour the wine not touching the lamb around the bottom and add the lemons if using on the top, side and under the lamb. Close the bag or place a lid on the pan and marinade overnight. Preheat the oven to 425 degrees the drop it to 325 degrees. Do not remove the juices. Roast in the oven on low 325 degrees until you prefer it cooked using a meat thermometer. Usually the 4 to 5 pound roast is done in 4 hours. Here are some other favorite recipes to try! I have to admit I never have been a fan of the taste of lamb. Maybe it was the way my mom cooked it? I did have some in an Indian restaurant once and wouldn't have known it was lamb if I hadn't been told! Maybe if you served this to me I could be converted? This looks so beautiful Claudia!!! Not many folks do lamb. I am glad you shared your recipe with us. It's expensive where I live and that could be one of the reasons it is not as popular as it should be. Also, it has to be marinated like you did. Best to you! 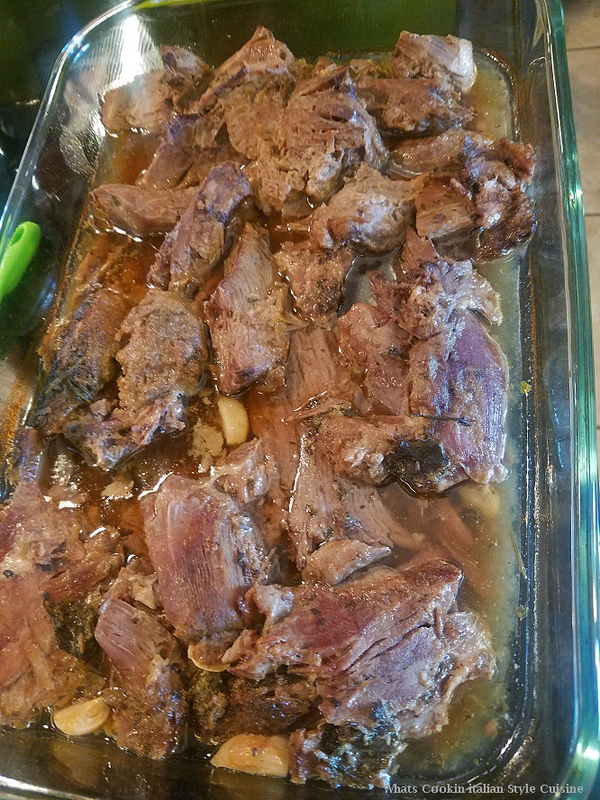 I love that you marinated your leg of lamb! We're doing a rack of lamb this year, but I'll keep this on my radar for next Easter. Bill loves lamb! !